Titanic Hotel Belfast is located in the former headquarters of Harland & Wolff, builders of Titanic, and provides the perfect destination for anyone travelling to Titanic Quarter on business or for pleasure. The Harland & Wolff Drawing Offices, the earliest parts of these historic buildings, date from the 1880s and over the following 100 years played an important part in the design of many of the world’s most famous ocean liners, the creation of the ‘floating hotel’ and influenced the design of many of today’s cruise ships. 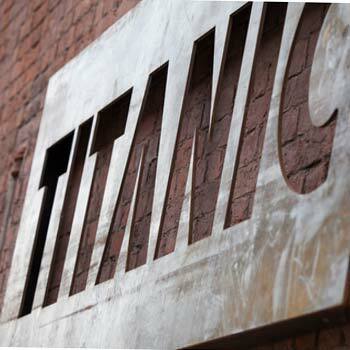 Belfast is the birthplace of Titanic and this heritage hotel is a sister to our award-winning Titanic Hotel Liverpool. The hotel is operated by Harcourt Developments; an international property development company with over 50 years experience restoring and renovating listed heritage buildings. All of our bedrooms have a nautical personality with streamlined Art Deco furniture, hanging ship’s lanterns, riveted panels and maritime artwork. Exquisite furniture and interior decorations ensure a perfect night’s sleep for all our discerning guests. Discover the new Belfast luxury hotel with our fantastic offers and promotions. Titanic Hotel Belfast is ideally located in the centre of the Titanic Quarter, an area transformed over the past decade into Northern Ireland’s premier leisure destination with numerous visitor attractions, heritage assets, restaurants and public spaces just metres from the hotel, making the building one of the best hotels in Titanic Quarter to explore the city. Guests can enjoy a rich variety of cultural and entertainment options within a short walking distance. From family visitor attractions to unique historic monuments, the Titanic Quarter has plenty to offer every age and inclination. Enjoy heavenly food to die for at the Wolff Grill Restaurant one of the best places to eat in Belfast and catch up with friends over lunch at the Drawing Office 2. Or why not treat yourself to Afternoon Tea at the Titanic Hotel, where you can indulge yourself with our selection of divine sandwiches and pastries. You can also relax and enjoy a beautiful cocktail at the Harland Bar, the newest cocktail bar in Belfast City. Host your special occasion or wedding in the magnificent Drawing Office, a truly unique events and wedding venue in Belfast. We also cater for meetings and conferences as well as private dining, available in any of our five heritage rooms – the former offices of the managing directors of Harland & Wolff and named in their honour. Speak to us about your ideas for before and after your wedding and we will seamlessly extend your celebration. This landmark building is now home to the world’s most authentic Titanic Hotel; where a warm welcome and an unforgettable experience awaits anyone visiting Northern Ireland on business or for pleasure. A visit to Titanic Hotel Belfast is infused with heritage and poignancy.